We have found the following products matching your search for Decode 1 8 Pearl Embellished Halter Style Gown 182970 . You are more than stunning when you wear this evening gown by Decode 1.8 182970. A unique Halter style gown with pearl beaded illusion collar in fine ruched bodice. Features a wide open back with similar pearl embellishment on the side straps. The shirred skirt cascades to full length hem. This Decode 1.8 dress is sure to get you a picture perfect profile! Style: deco_182970 Details: Jersey Mesh, Faux pear embellished, Back zipper closure Length: Long Neckline: Halter Waistline: Empire Silhouette: A-Line This special occasion dress is on Sale! Please refer to our special occasion dress return policy (click here) for more details..
Take their breath away with this stunning dress by Decode 1.8 182902. Brandishes in a sleeveless, halter neckline with sparkling embellishments. The fitted bodice is highlighted with ruched details and flows in a sheath skirt with front slit. Be in this dazzling Decode 1.8 creation and leave a lasting impression. Style: deco_182902 Details: Jersey (95% Polyester 5% Spandex) Lining (100% Polyester), Sleeveless, Embellished neckline, Ruched bodice, Front slit, Back zipper, Racerback Length: Long Neckline: Halter Waistline: Natural Silhouette: Sheath This special occasion dress is on Sale! Please refer to our special occasion dress return policy (click here) for more details..
You will be an enchanting beauty in Decode 1.8 182942. 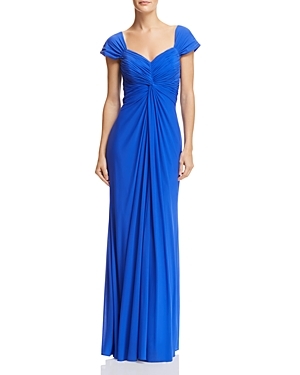 This dress offers a halter neckline with crossed tie back. The bodice is covered with embellishments and the skirt is made of chiffon fabric. Decode 1.8 is a charming choice for any special event. Style: deco_182942 Details: Embellished bodice, Two-piece, Chiffon (100% Polyester) Lining (100% Acetate), Crossed tie back Length: Long Neckline: Halter Waistline: Natural Silhouette: Sheath This special occasion dress is on Sale! Please refer to our special occasion dress return policy (click here) for more details. Look immaculately gorgeous in this lovely Decode 1.8 183020 long gown. The strapless bodice is embellished with floral design and sequins, waist is ruched, back is mid open and has center zipper. This Decode 1.8 evening gown will not let anyone missed you grand entrance. Style: deco_183020 Details: Strapless, Embellished Bodice, Floral, Ruched Waist, Mid Open Back, Back Zipper Length: Long Neckline: Sweetheart Waistline: Empire Silhouette: A-Line This special occasion dress is on Sale! Please refer to our special occasion dress return policy (click here) for more details..